oDash is an event management software created to help event organizers and firms attract and engage potential audience and empower them to attend the users’ events. The platform comes equipped with the tools and technology to help them expand their reach to increase discovery by their target audience via event listing, native event app, pre-registration forms, and custom event websites. With oDash, users are able to reach their target audience and provide them with materials, updates, and more to exert influence and encourage them to attend the events. The platform is loaded with audience engagement capabilities such as event interest generation, lead generation and management, notifications, and alerts, invite and share to mention a few. 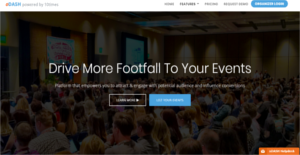 oDash is the event management platform of choice for many event organizers and firms. It has listed over 272,000 events on a global scale, access to more than 30 million people, and is widely used across over 120 industries. oDash offers you with a powerful and smart event management platform that helps you get your events out there where your target audience can easily discover them and encourage large footfall to your happenings. The software helps you reach out to your audience by listing your events on a global platform that can be accessed by 30 million people. You can also create your own event website complete with branding factors, allowing you to showcase your events as well as other content and materials that promote your business. Engaging your audience once your capture their attention and interest is crucial to the succcess of your events. oDash helps you keep in touch with your audience and keep them upated with news and announcments through robust lead management capabilities, invitation and sharing tools, notifications and alerts through SMS, Email, and Voice, etc. You need to go through your data to help you know what areas you need to work on and what opportunities might be waiting for you to discover. Critical information such as the prevailing gender or age group or background of your audience as well as their feedback and popular opinion about your events help you know your audience better. oDash has powerful data analytics to help you understand your data, create benchmarks, and make sound decisions that will impact your future events in the most positive way. What Problems Will oDash Solve? Organizers constantly deal with the difficulties of spreading awareness about their event. With oDash, users able to list their events on 10times, the largest event discovery platform in the world. This functionality makes their events discoverable to more than 25 million annual users. Companies shell out large sums of money to generate leads and market their events. oDash generates free multiple types of leads from all across the globe. These leads may be visitors / exhibitors / speakers / sponsors. What’s more? They get a CRM inside the oDash to manage these leads better. oDash provides users the option to launch templatized event websites and native mobile apps (Android and iOS) instantly. All data can be updated/edited via the CMS built into the product on a real-time basis. If you are considering oDash it might also be sensible to examine other subcategories of Best Event Management Software listed in our database of B2B software reviews. Each company has its own characteristics, and can need a special Event Management Software solution that will be designed for their company size, type of customers and staff and even specific industry they deal with. You should not count on locating an ideal solution that will work for each company no matter what their background is. It may be a good idea to read a few oDash reviews first and even then you should remember what the software is supposed to do for your company and your staff. Do you need a simple and straightforward app with only basic features? Will you really make use of the advanced tools needed by pros and big enterprises? Are there any specific tools that are especially beneficial for the industry you work in? If you ask yourself these questions it will be much easier to find a trustworthy service that will fit your budget. How Much Does oDash Cost? oDash offers three SMB and enterprise pricing packages for users to choose from. Give the details a look, and select the best plan for your business. We realize that when you make a decision to buy Event Management Software it’s important not only to see how experts evaluate it in their reviews, but also to find out if the real people and companies that buy it are actually satisfied with the product. That’s why we’ve created our behavior-based Customer Satisfaction Algorithm™ that gathers customer reviews, comments and oDash reviews across a wide range of social media sites. The data is then presented in an easy to digest form showing how many people had positive and negative experience with oDash. With that information at hand you should be equipped to make an informed buying decision that you won’t regret. What are oDash pricing details? What integrations are available for oDash? If you need more information about oDash or you simply have a question let us know what you need and we’ll forward your request directly to the vendor.